(Newser) – Republicans officially kicked off their convention today, but only officially. 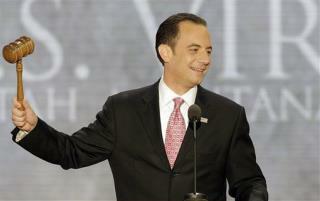 RNC Chairman Reince Priebus gaveled the convention to order before dozens of delegates in a mostly-empty hall today, the AP reports, but 10 minutes and a giant debt clock later he'd adjourned the proceedings thanks to Tropical Storm Isaac. Still, Republicans did their best to carry forward the day's agenda—namely bashing President Obama—in other ways, CNN reports. Wake up America, the two biggest criminal organizations in the world are. #1 the replubician party #2 the democratic party. If we love America then we have to vote the crooks out and the independents in. "GOP opens convention, immediately adjourns. ".......If only. That's funny. The GOP congress opens and immediately adjourns too.